Entered according to Act of Parliament of Canada, in the year one thousand nine hundred and nineteen, by Eugene G. Courteau, M.D , at the Department of Agriculture. It is with great pleasure that I attempt to compile a list of the Bank of Montreal copper tokens, especially at a time commemorating the centenary of the foundation of one of our greatest - if not the greatest - financial institutions. I had hoped to have published this book in 1917 or 1918, but the war, and my professional duties during the epidemic of influenza, prevented me from doing so. At the dawn of the 19th century, Commerce and Industry in Canada increased considerably, especially in the town of Montreal. The Molson family added much to the development of trade in being the first to inaugurate steam navigation on the St. Lawrence river, and ever since, the name of that progressive family has been associated with commercial enterprises. They (the Molsons) left to collectors also a memento of their great trading in grain with farmers in the form of a copper "sou," dated 1837. In 1817, for the first time the Bank of Montreal opened its door to trade and commerce, and, despite the critical times the country had to go through in the thirties, its wise management was crowned with success; steadily gaining in strength and reputation; it to-day is justly considered one of the strongest financial institutions of this continent. From 1834 to 1841, the state of affairs was so bad and the small currency for many years back was in such deplorable state, that the Bank seeking for a remedy to relieve the situation applied to the British Government for an authorization to issue copper tokens. This was the cause of the issue by the Bank of the tokens described in this list. Some authors have stated that certain varieties of the Ships, Colonies and Commerce tokens were struck by the Bank of Montreal, but this being doubtful, I think best to not include them in the list. Concerning the degrees of rarity, I must admit that it is difficult to give them in a strictly accurate manner, because most of the varieties, included in this list are here described for the first time. The different degrees are given after most careful examination of a great number of specimens, the accumulation of many years. Specimens rated R. 1 or 2 are relatively common, while those rated R. 7 or 8 are very rare, R. 9 of the utmost rarity and R. 10 unique. The more striking points of dfference in these tokens are found in the stems of the rosebuds and in the relative positions of the laurel leaves opposite the word bank. These are generally termed the English bouquet-sous on account of their having been made at Birmingham, and further from the error in spelling the word "Sous" plural, instead of singular. Obv. Bouquet made up of shamrock leaves, roses, rosebuds and leaves, thistles and leaves, and ears of wheat, trade & agriculture - lower CANADA. The stem of lower rosebud on left is heavy, almost straight, and overlaps the upper shamrock; that of the upper bud is attached below the centre; the bud to right has a long, straight stem; the ribbon has bow to left with one end on either side. Rev. UN I sous within a wreath ; above, BANK OF MONTREAL, below, TOKEN. Laurel branch of 21 leaves; the central leaf of a group of three opposite NK in bank has a short, slender stem; the first palm leaf under the letter S is forked, with the left much shorter than the right. R. 2. Obv. The stem of the lower rosebud is long and much curved, that of the upper bud is joined at the centre; the right bud has a long, slender stem curved somewhat upwards; the ribbon and bow as in last. Rev. The stem of centre leaf opposite NK is wanting and the palm branch lighter, with the two parts of its inside leaf long and equal. R. 4. Obv. Stem of lower left bud starts from upper shamrock, and slightly bends near its junction with the bud, the upper one has no stem; that of right bud is short and starts from a small leaf; bow to left with ends of ribbon on either side. Rev. Closely resembles No. 3, but stem of centre leaf opposite NK is long and heavy. It occurs in different sized flans. R. 2. Obv. The stems of all the rosebuds are short and very slight, while that of the right thistle is wanting; the petals of the right rose are single, whereas they are double on the preceding varieties, this rose has no stem; double bow to left with two ribbons extending to either side. Rev. Differing from the others, the laurel branch having 20 leaves and a small stem, near the berry, pointing to N in bank; two of the laurel leaves opposite NK have no stems. The letters are heavier. R. 4. Obv. All the rosebuds are without stems; single bow to left with ribbon at either side. Rev. The three leaves opposite NK have very light stems, two of which are connected with that of the berry and the third disconnected from the branch. R. 4. Obv. Same as No. 3. Rev. Similar, bank token above the wreath, Montreal below. R. 6. Bank Token straight stem variety. Obv. Same as No. 5. Rev. Same as No. 8. R. 2. Obv. Same as No. 6. Same as No. 8. R. 3. Obv. Stem of. left bud is broken; the right thistle has a very slender stem, while that of the next bud is wanting, as well that of both roses; single bow to left with ribbon on either side. Rev. Same as No. 8. R. 5. Obv. The stem of the lower left bud is short, very distinct, and connected with a short line extending to the rose; those of the thistles, the rose, the bud and rose leaves to right are also distinct. Rev. Closely resembling No. 8, but the stem of laurel leaf near BA connects with that of the berry; straight ribbon pointing to R in MONTREAL. R. 4.
very short and comes from a small leaf which is directly under the rose - the only instance. The letters are heavy and old style, the "&" is large. Rev. Same as No. 8. R. 6. Most of these varieties are produced by retouched dies: Nos. 3, 4, 5, 7 and 13 having No. 7 as prototype, while 6, 9, 10 and 11 have No. 6. The reverse of No. 6 is from an altogether different die. These tokens are always found with serrated borders and plain edge. These tokens were issued by four banks: the CITY BANK, the Quebec bank, the banque DU PEUPLE and the bank of Montreal. The latter only will be described here. The type on the obverse represents a farmer (known here under the name "habitant") of LOWER CANADA - now the Province of Quebec. The dress he wears consisted of a coat of home spun with "capuchon" (cowl or capouch), "ceinture flechee" (sash with arrow-shaped design), "tuque bleue" (woolen blue cap) and "souliers de boeuf" (soft leather shoes without soles). This may be considered the national costume of the Province of Quebec at that time. The Arms on the reverse are those of the City of Montreal, designed by Jacques Viger, first mayor of that city, and were approved by the Council in 1833. The motto on the garter: "concordia salus" (Safety in Union - of the races) is appropriate, as at that time the population of Montreal was mostly composed of Scotch, represented on the shield by a thistle, English by a rose, Irish by a shamrock, and French - which were by far the most numerous - by a beaver, as pioneers of the country. The beaver and maple leaf being the recognized emblems of Canada. The points of difference in the halfpennies will mainly be found in the relative position of the letters on the obverses - in many instances the letters S's are inverted; then on the reverses the upper shamrock leaf is in some instances disconnected from the main stem and in others is not. On the pennies, the difference is in the whiplash, the period after Canada, and in the shamrock sprig on reverses. Obv. Man standing with a whip in his right hand, province du bas Canada - UN sou. The letters S's in bas and in sou are perfect. Rev. The Arms of the City of Montreal with its motto concordia salus on garter. bank of on left ribbon end, Montreal on right, incused. 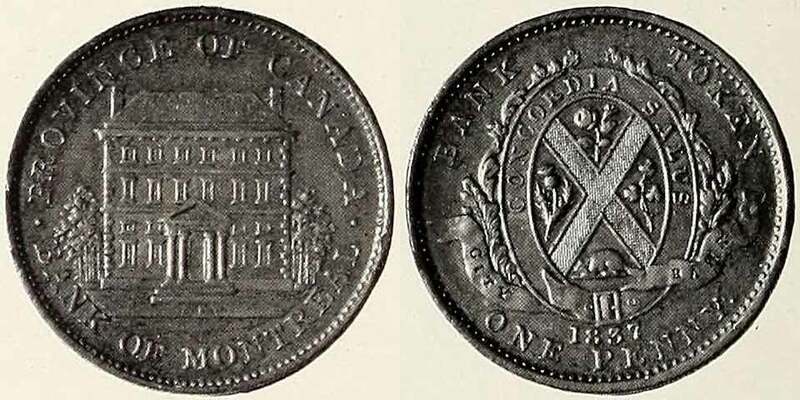 Surrounding the arms bank TOKEN - half penny, under the arms 1837. The upper shamrock leaf is disconnected from the sprig main stem. R. 1. Obv. The S in bas is inverted; the right foot of first A in Canada is on line with that of letter N.
Rev. The upper shamrock leaf is joined to the stem and there is a small leafless stem between the leaf above named and the left one. R. 1. Obv. Same as No. 15, but the right foot of A in CANADA is above that of letter N.
Rev. Same as No. 15. R. 3. Obv. Same as No. 16, but the C in CANADA is farther from letter A, the top of which is recut to the left. Found from perfect and broken dies. In the latter case the break extends from border to man's right foot. Rev. Same as No. 14. R. 4. Obv. The S in sou is inverted. From a cracked die, the crack shows from border to the man's right leg. Rev. Same as No. 14. R. 3. Obv. The letter I in province is above N ; the S in bas and in sou are inverted ; the right foot of A in Canada is on line with that of letter N. Found with and without break in the die; in the former case the die shows a faint crack from border passing close to S in sou, to the ground. Inverted S in bas and in sou. Obv. Same as No. 19, but I in province is on line with letter N.
Rev. Same as No. 15. R. 4. Obv. Closely resembling No. 20. Many of the letters are recut, more especially the A's. There is a slight difference in the position of the D in Canada, and in some other letters. Rev. Same as No. 14. R. 5. Obv. Same as No. 20, but the right foot of A in Canada is above that of letter N. Found in most cases with a crack in the die from border touching ground and extending to man's right thigh. Rev. Same as No. 14. R. 1. Obv. Same as No. 22, but the letters VIN in province are on line and the D in DU tilts to the right. Obv. Similar, but deux sous. The lash of the whip in man's right hand is partly visible. There is a large period after Canada. Rev. Similar, but one penny. The shamrock sprig on coat of arms has three leafless-stems - none above left leaf; the lower right one is forked, but the lower part of bifurcation hardly shows and is close to upper one. R. 2. Obv. Same as No. 24, but the period after final A is smaller and closer to same letter. Rev. The shamrock upper leafless-stem turns around the main stem away from it, and the two lower ones are plain and barely visible. R. 4. Obv. Same as No. 25. Rev. Both lower leafless-stems of shamrock are forked - the only instance. Probably from the same die as to that of preceding number but retouched. R. 3. Rev. Resembles No. 24, but the lower right leafless-stem of shamrock is heavier, both parts of bifurcation show well and are distant from each other. R. 6. Obv. The whiplash is entirely visible and there is no period after last A in CANADA. Usually found with a break in the die from border through left limb of U in sous, extending to the field. Rev. Same as No. 25. R. 2. Obv. Same as No. 28, but the ground under man's left foot is more in relief and extends farther to the right. The foot of N in PROVINCE is not on a level plane, the left part being higher than the right. Generally found with a faint crack in the die from border to bottom of U in sous, to the right. Rev. Same as No 27. On this and on No. 27 the points of right ribbon are not well up, in most cases the right one hardly shows. R. 2. The habitant tokens, the side-views and the front-views have all borders of small dots and a plain edge. I am greatly indebted to Messrs. S. H. and H. Chapman of Philadelphia, for the description of these tokens, the particulars of which I have mostly taken from their able description of this series, in Mr. Chaloner's sale catalogue. Obv. Front and side view of a building. BANK OF MONTREAL. Below ground, 1838. Each fence next to the building is divided by a tree; the left has thirteen upright palings - 8 to the left of tree, 5 to the right; the right has eight palings - 3 to the left of tree, 5 to the right. Rev. Similar to No. 14, but no date under the arms and bank of Montreal on ribbon in raised letters. The beaver's tail covers the top of left stem of M ; the rose faces to the left; the lower right leaf supporting arms does not touch N. No period after SALUS. There is a small dot in the angle above beaver. R. 8. Obv. The left fence, has eleven upright palings - 6 to the left of tree, 5 to the right; the right has seven palings - 3 to the left of tree, 4 to the right. 1838. A slight line, or crack running from lower corner of the building across fence to left tree is peculiar to this variety. Rev. The beaver's tail touches M, but does not cover it; rose faces upward; the lower right leaf touches N. Period after salus. There are two small dots above the lower angle of St. Andrew's cross. R. 8. This variety is in the collection of the American Numismatic Society of New York, and was discovered by Mr. Wm. Earl Hidden of Ocean Grove, New Jersey, to whom I am greatly indebted for a full description of this token, and of many other kindnesses. Both obverse and reverse are different from others, but closely resemble No. 31. Obv. The left fence has eleven upright palings - 6 to the left of tree, 5 to the right; the right has eight palings - 3 to the left of tree, 5 to the right. The ground in front of the building is much heavier, hence closer to figures 838. On this, the slight line from corner of building to left tree is wanting. 1838. Rev. The rose bud comes from rose instead of from leaf. The middle left leaf surrounding arms touches N, the upper right one is very close to letter T, and both points of right ribbon are shorter. Period after salus. No dots above lower angle of St. Andrew's cross, or below same angle. R. 10. Obv. Similar. The left fence has fifteen upright palings - 9 to the left of tree, 6 to the right; the right has eight palings - 4 to the left of tree, 4 to the right; the eave of building points to B in bank. 1839. Rev. The beaver's tail rests on inner rim of garter; the left point of right ribbon touches leaf: No period after salus. R. 8. Obv. The left fence has fourteen upright palings - 9 to the left of tree, 5 to the right; the right has seven palings - 3 to the left of tree, 4 to the right. Eaves of building point between B and A, and A and L. 1839. Rev. The beaver's tail does not extend to the garter; the left point of right ribbon is away from leaf. No period after salus. R. 8. Obv. Same as No. 33. Rev. Same as No. 34. R. 8. Rev. Similar, but one penny. The beaver's tail nearly touches left top of M ; the middle left leaf supporting arms points to A. No period after salus. R. 8. Obv. Sam.e as No. 36. Rev. The tail of the beaver is wider and points to left foot of M ; the middle left leaf points between A and N in bank. No period after salus. R. 8. Rev. Similar, but period after salus. R. 8. Obv. Same as No. 38. Rev. The inscription on ribbon reads BANQUE DU PEUPLE. Period after salus. R. 9. All the 1839 tokens have the inscription on ribbon incused. On both tokens, the side - and front-views, the buildings and the trees have several points of difference, especially the trees; on the former type they are short and bushy, while on the latter they are taller. The different positions from which the building had been sketched would however account for this; but if I may judge from a picture taken in 1846, which I have seen, I would consider the "side-view" a more accurate representation of the building than the "front-view," though the latter is of much better execution. A careful examination of these tokens will reveal in many specimens small defects and cracks in the dies. Some of these I have purposely omitted to mention when the identification of the token is otherwise certain. The mere presence of a die crack is not enough to constitute a distinct die variety. I have, however, made exceptions in certain cases, more especially when describing the pennies of this series, when the description of the die cracks will aid in their identification and subsequent classification. 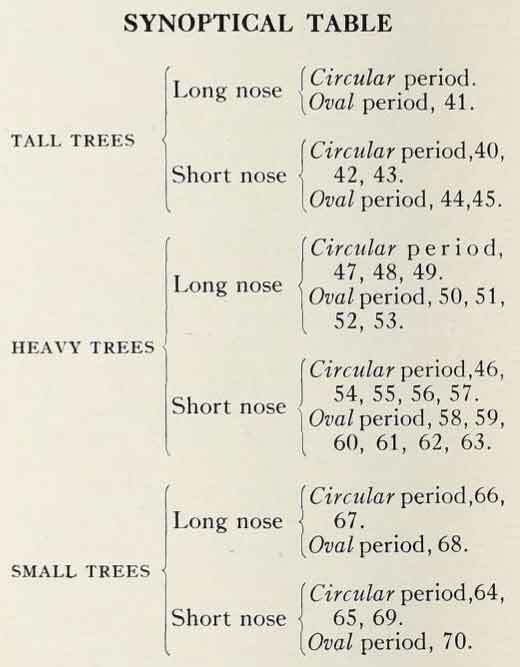 In order to facilitate the description of the half pennies, I have neglected the chronological order and will divide them into three groups, viz., the "Tall trees," the "Heavy trees" and the "Small trees." In the last two groups, the heavy and the small trees, there is a small defect in the die having the form of a line running from the first upper right window to border-stone, and the sixth cornice block from the left, and the left half of porch roof are recut. This induces me to believe that they are from the same obverse die, though evidently the "Heavy trees" group from the die after it had been retouched. These half pennies are found with two distinct letters M in Montreal, the opened one and the closed one. In the opened M variety, the angle formed by the central part of the letter comes down on line with both feet, but points towards left one; whereas in the closed M variety, the angle does not come so low and points towards right foot. Since the varieties with the opened M are more numerous, in the description I shall avoid mentioning them in all cases, but will do so for the closed M. Same remark regarding those dated 1842, they will be mentioned in all cases, whereas the 1844 tokens will be so only where the date changes.Therefore when the date is not given, it will be understood that it is 1844. To avoid repetition in describing reverses, I think it best to mention here that there are two varieties of beaver on shield, one with a long nose and the other with a short one. In the long-nose variety the beaver has rather the head of the common house rat - the nose being too sharp, and the ornamental leaf surrounding the garter to the left is always met with a long inside point at bottom, hence a wide, deep notch ; whereas in the short-nose the head resembles mora closely that of a beaver and the inside point at bottom of left leaf is short, hence notch more superficial and angular. With this in view, I believe that the task of collectors in identifying varieties will be much easier. The collector must be careful, whan grouping his tokens for the purpose of identification, that he keeps each variety of tree groups separate. By doing this he will avoid mingling the "Tall trees" varieties with either of the other groups, and vice versa. Moreover, he should ascertain whether the coin he wants to classify bears a long or a short nosed beaver, a circular or an oval period - particularities mentioned after the description of each variety, and find out if these particularities correspond with the coin he desires to identify. For instance, a "Tall trees" variety with a long nosed beaver and an oval period will bring him to No. 41, while a "Tall trees" variety with a short nosed beaver and a cir- cular period will either be No. 42 or No. 43, and soon. Group 1 - Tall trees. The trees next to building are tall, especially the left one, the top of which is close to and on line with the upper string course (a level range of bricks or masonry projecting slightly in front of the building at the intersection of each story, this string course marks the division of the building into stories). The striking feature of this type is in the appearance of same tree which is distorted-like, as under a strong wind. Obv. Front of a building, PROVINCE OF CANADA - BANK OF MONTREAL. The M in MONTREAL is closed at bottom. Theleft fence has always three upright palings in the whole three groups, whereas the right varies in many instances; this fact will be mentioned in each case. In this group the right fence has three upright palings proper. Rev. Same as No. 14, but dated 1842. The beaver has a short nose; the period after salus is circular. From one state of the die. R. 7. Short nosed beaver, circular period. The varieties dated 1842 are all met with the figure 1 recut at the top. Obv. Same as No. 40. In many instances, this is found with defects in the die that block either the upright paling next to building, to the right, or the left chimney, or both. Rev. Same as No. 40. Dated 1844. The beaver has a long nose; the thistle sprig has no stem; oval period after salus. R. 2. Long nosed beaver, oval period. Obv. Same as No. 40. Rev. Dated 1844. The beaver has a short nose; the period after salus is circular; the right ribbon-end has long points with the left almost straight. R. 2. Obv. Same as No. 40, but the letters F are old style and M in Montreal defective, which gives it a clumsy appearance; the C in Canada is recut. Rev. Long points at right ribbon with its left bent abruptly. The 4's in the date are closed together and last one placed higher up. Close 44. R. 3. Obv. Same as No. 40. The defects in the die are more numerous on this than on No. 41, several extend to the roof. Rev. The period after salus is oval and both points of right ribbon are short. The 4's in the date are widely spaced, v/ith the top of first one directly under the bar of buckle. Wide 44. R. 3. Short nosed beaver, oval period. Obv. Resembles No. 43, the F's are also old style but double cut, the letter c is perfect; the M in Montreal is rather of the opened M variety. Rev. Same as No. 44, but the 4's in the date are closer together with top of first one to the left of bar. R. 2. Group 2 - Heavy trees. In this group the trees are not so high, the top of left one being farther from building and below upper string course. There is a short line from base of left fence running upwards. Obv. Similar to No. 40. Closed M in MONTREAL. This is indifferently met with perfect or defective fence to the right. In the perfect one the three usual upright palings show; in the defective there are only two perfect palings at the fence, either the right or the left is partly wanting. Rev. Same as No. 40, 1842. From two states of the die. R. 1. Obv. The gable of the porch shows an inner moulding - the only instance amongst the "Heavy trees." Opened M in Montreal. All the obverses of this group found with opened M have a defective right fence, only the centre upright paling shows entirely. Rev. The beaver has a long nose; the thistle sprig has no stem; circular period after salus. 1844. R. 4. Long nosed beaver, circular period. Obv. Same as No. 47, but no inner moulding at gable. There is a small break at the top of the porch where both sides of the roof join. A feature found on all the "Heavy trees" dated 1844, the preceding number, 57 and 63 excepted. Rev. Same as No. 47, but the 4's in the date are closer together and the last one is differently placed. The period after salus is a trifle larger. R. 2. Obv. Same as No. 48. Rev. The thistle sprig has a stem, and that of the flower joins bulb to the left. R. 3. Long nosed beaver, circular period. Rev. Same as No. 41. R. 3. Obv. Same as No. 48, but the first left window of middle story is broken. Rev. Thistle sprig with stem. There is a very small dot before first C in concordia and a defect at the top of figure 1, at right. R. 2. Obv. Same as No. 51. Rev. No stem to thistle sprig. In the date the figure 1 has the form of letter I, and both points of right ribbon are long. R. 5. Obv. Same as No. 46. Closed M. This is always found with only one perfect upright paling in the centre of right fence. The only instance in which this occurs amongst the "Heavy trees" with closed M.
Rev. Same as No. 52, but perfect 1 in the date, and points of right ribbon closer together. R. 3. Rev. The Shamrock upper left leafless-stem is short, the lower right one curves downward; points of right ribbon are short. The 4's in the date are widely spaced. Wide 44. R. 2. Obv. Same as No. 48. It is sometimes found with a small defect in the die alongside of the right chimney. Rev. Same as No. 43. Close 44. R. 3. Obv. Same as No. 46. Closed M. On this, the right fence shows only two perfect upright palings, that next to building is partly wanting. Rev. Same as No. 43. Close 44. R. 2. Short nosed beaver, circular period. Rev. Same as No. 44, but from two states of the die - heavy and light design. In some cases there is a little defect to be found at the garter's right hole. This defect always corresponds with a break in the obverse die through O in of, under the ground. Wide 44. R. 1. Rev. Same as No. 44. Wide 44. R. 5. Obv. Though being of the "Heavy trees" group, the lettering closely resembles that of No. 45, the F's are old style and double cut, and M in Montreal much alike. Rev. Closely resembles No. 60, but the outline of the thistle flower at top is clear cut always and the second 4 in the date is differently placed. R. 3. Obv. Closely resembles No. 61, but the left window of second story is broken, and some other minor details. Rev. Same as No. 45. R. 5. Obv. Same as No. 46. Closed M. This has only two perfect upright palings at right fence, the one next to lettering is not well struck up, and in many instances hardly shows. Rev. Same as No. 61. R. 5. The trees are smaller and there is no line running upward from base of left fence. The T in MONTREAL is away from ground, R farther from side-walk, E from base of fence. The die used in the striking of the obverses of this group is undoubtedly the prototype of the " Heavy trees." This explains the lighter design found on the "Small trees" varieties. Obv. There is a heavy line running parallel to the roof of porch, to left, hence double roof porch variety; several of the window tops of second and third stories are also recut. The M in Montreal is closed at its base. On this, the three upright palings of right fence are entire. Rev. Same as No. 40. 1842. From one state of the die. R. 3. This token is most likely from the die when first in use. After striking a certain number of them, the die-cutter discovered his mistake (the parallel line along the porch left roof) and proceeded to correct it, leaving a trace of his recutting above the small window next to the porch, to left. This would explain the appearance of same defect on all the "Small trees" and the "Heavy trees" varieties. Obv. Same as No. 64, but the parallel line removed. Closed M. Generally found with perfect right fence; however, in some instances, it is met with same fence having only two upright palings, that next to building being partly wanting. Rev. Same as No. 40. 1842. From two states of the die. R. 1. Obv. Resembles No. 65, but lighter design, especially that of the trees; there is a moulding at the gable of the porch - the only instance amongst the "Small trees." Opened M in MONTREAL. This is always met with a perfect fence to right. Rev. The thistle sprig has a stem and both points of right ribbon show. 1844. R. 3. Obv. Resembles No. 66, but no moulding to gable, and broken window at second story, to left - the right frame being recut. There is a small defect at foot of F in OF below ground. Always found with the upright paling close to building partly wanting. Rev. Same as No. 48. R. 3. Obv. Same as No. 67, but perfect window. On this the defect at foot of same F is more visible. Found with the upright paling close to building somewhat bent. Rev. No stem to thistle sprig; the shamrock has but one short leafless stem to left; points of right ribbon are long. R. 2. Obv. Same as No. 67, but no defect at letter F. Found with the upright paling close to building with the lower part cut in full and the upper one half cut - hence thinner. In rare instances the fence shows three perfect upright palings. Rev. Both points of right ribbon are short. There are two small lines emerging from garter but opposite way, one over last 4, the other from right; in most instances the right is barely visible. R. 2. Obv. Same as No. 69. This is often found with several breaks in the die, especially at the roof. The right fence on this presents the different particularities found on all the other obverses of this group, except the bent paling. Rev. Closely resembles No. 69, but there is no leafless stem between the top and the left leaf of shamrock sprig; oval period after SALUS. The nose of last 4 in the date points a trifle lower, hence the horizontal bars of both 4's - not the feet - are not on line. Period after penny barely visible. On this variety the right line emerging from garter is more visible. R. 2. I have failed to find any opened M amongst the 1842 and closed M amongst the 1844 of this group. Before closing with this series, let me mention here that there is to be found a half-penny dated 1845, but as this token is generally known as a pattern, I feel justified in mentioning the fact only and in not assigning to it a separate number. Varieties with closed M : 40, 41, 42, 44, 46, 53,57,63,64, 65. The points of difference in the obverses of these tokens are in the door, which in some cases has mouldings and knob and in others has neither. In the left fence, which is sometimes found perfect and other times broken. In the letter A's, which on some varieties are perfect and on others lack part of right ceriph. Some of the windows also show differences in the frames and bars. In the reverses, the main points of difference are to be found in the left thistle leaf, on some varieties it is perfect, on others it is short of one point inside; in the leafless-stems of the shamrock sprig, which in some instances are all forked and in others are not; some varieties show four leafless stems, others only three. I shall divide these tokens into two groups: those with perfect fence and the others with broken fence, to the left of building. In the perfect fence group, the upright paling next to building is entire, though in some cases lightly cut; in the broken fence group, the lower part of same paling is partly or entirely wanting. Obv. Similar. The gable of the porch has a moulding. The left fence is perfect. It is found from perfect and broken dies, but rarely from the former, the latter shows three cracks. Rev. Similar, but one penny. 1842. The left thistle leaf is short of one point inside, its terminal is long and thick and the left notch near it is higher than the right; the shamrock sprig has four leafless-stems, and only the upper right one can properly be styled forked, the lower left one is straight. R. 3. Obv. Without moulding to gable of porch on all others hereafter. The door is perfect and shows a double moulding, the inner one partly cut; knob plainly visible on the door; the sill of first window at second story, to the left, slants to right. Mostly found with two cracks in the die, one from border to second A in Canada, the other, a faint one, also from border to N in bank. Rev. Same as No. 7L R. 2. Obv. The mouldings on the door are very lightly cut - upper part hardly shows; the knob is very faint, to the right of the door, and shows only on fine specimens. The upright bar of the window next to left fence is close to left frame. The left fence is perfect, but paling next to building lightly cut. From perfect and broken dies. The latter shows several cracks; however, in many instances only one or two appear, especially that from border to the roof of building, passing close to E in PROVINCE. Rev. Same as No. 7 L R. 2. Obv. Perfect door without inner moulding; knob plainly visible. The window next to the right fence has a small defect inside the left frame. Rev. The left thistle leaf is perfect and its terminal is thin and curves outward, the left point close to same terminal is away from and the right is close to, almost touches it. The shamrock has four leafless-stems, three of which are forked, the upper left one bends abruptly upward, the lower left is plain and curves upward. R. 3. Obv. In most instances there is a defect in the die at the upper part of the door, inner moulding to same ; the knob is large and well in centre. The upright bar of second left window, at second story, extends below sill. Found from perfect and broken dies; those from the latter show two or three cracks, but that from border to the roof of building, passing through C in province, is more conspicuous. Rev. Same as No. 74. R. 3. Obv. There is a bad break at the door - the mouldings and knob hardly show. There are also to be found two faint cracks, or lines in the die: one from the left end of first window sill at second story, at left, and the other over the small window next to the porch, at right. There is also a defect having the form of a dot at the right end of window sill next to the porch, at right. Perfect A's. Rev. The left thistle leaf is short of one point inside, the right point of same leaf is a trifle farther from terminal than the left, and longer; the shamrock sprig has only three leafless-stems, all forked - the only instance. The upper left one is wanting. R. 5. Obv. The door is perfect and the mouldings are close together. One additional upright bar at the upper part of the first left lower window and a Y-shaped defect in the die, appearing between the second and third left window of second story, are a feature of this variety. Besides these defects many specimens are found with one or two cracks in the die; in the former case, it runs from border to the base of chimney, passing through I in province; in the latter, the second crack is also from border, extends to the ground and passes through O in Montreal. Perfect A's. Rev. Perfect left leaf at thistle with the uppermost points equally distant from terminal. Shamrock with four leafless-stems, three of which are forked; the upper ones are horizontal, the lower left is plain and curves upwards. R. 2. Obv. Closely resembling No. 77, but the lower left window is perfect and the second left window of second story has no lower crossbar. The only specimen I possess presents no inner moulding at the door. From a perfect die. Rev. Same as No. 77. R. 5. Obv. The door is perfect, shows traces of inner moulding and has a large knob. The right ceriph of A in bank is defective (the inside part is wanting). Found from a cracked die; one from border touching top of N in BANK, extending to the sidewalk, the other to D in Canada. Obv. Resembles No. 79. The right ceriph of A in bank is also defective, but the upright paling of left fence next to the building is broken. The F in of below ground is unfinished - the top being disconnected and the ceriph, or foot of same letter is wanting. It presents also other minute details. The only two specimens I had the opportunity to see show several cracks in the die, especially one from border through K in bank, across sidewalk and building. Rev. Same as No. 77. R. 4. I am greatly indebted to Mr. S.S. Heal, of Toronto, for the knowledge of this variety and of No. 83 (both were unknown to me), also for the loan of his entire collection of the front-view tokens, in order to compare them with mine. Obv. Perfect door with very slight traces of inner moulding, but knob plainly visible. All the lower windows show some defects; the first left window a small defect to the left of sill, the second has its right frame double cut, those to the right of porch have defects at their right frames, but barely visible on this. The lower part of the upright paling next to building at left is wanting. From perfect and broken dies, but rarely from the former. Those from the latter present two cracks; one touching B in bank to the tree, another through V in province to the eave of building. Rev. The thistle left leaf is perfect and its left point close to terminal is shorter than the right; the shamrock sprig lacks the usual upper left leafless stem and only its lower right one shows bifurcation. R. 2. Obv. Resembles No. 81. The door is perfect also, but both outer and inner mouldings are plainly visible ; large door knob. The upright paling next to building though broken shows lower part. The only specimen I have seen is from a cracked die: the first crack is faint and from border-stone, touching left top of window next to left fence, extending under small window above; the second is large, extends to the eave of building, passing through the right limb of N in Canada, and the last, which is slight, also from border to the tree, touching the period after final A.
Rev. Same as No. 81. R. 5. This variety and No. 76, which is a proof, belong to His Honor Judge Lees, of Camrose, Alberta, who had the kindness to send me for inspection his whole collection of the Bank of Montreal front-view tokens. Obv. Perfect door with inner moulding, but knob faint. A small line close to right frame of window next to the porch, to right, and defective ceriphs to the two first A's in CANADA characterize this variety. Obv. There is a break in the die at the upper part of the door, which has a large knob, well in centre. None of the windows' upright bars extend below sill. The cutting of the letters is somewhat lighter. Rev. The left thistle leaf is short of one point inside; the left notch close to terminal of same leaf is much lower than the right; the shamrock sprig presents the same particularities as to that of No. 81, but the bifurcation of the lower right leafless-stem is wider. R. 4. Obv. Same as No. 81, but from a retouched die. The upper part of outer moulding on door is not entirely up. The defects at the right frames of lower right windows are plainly visible. There are some other unimportant details. Perfect die. Rev. The left thistle leaf is perfect, but the inside point is not as long on this as on others; the uppermost right point of same leaf is longer than the left and closer to terminal. The four leafless=stems of shamrock are forked- the only instance. R. 2. Obv. Perfect door with inner moulding and knob. The right frame of the window left to the porch is partly disconnected from the top. The right ceriphs of the two first A's in CANADA and that of A in bank are defective. Found with several cracks in the die. I have a copy in my collection that shows only two cracks : one from border to the eave of building, passing close to N in Canada, the other, a faint one, from base of right column extending to the uppermost borderstone of second story. Rev. Same as No. 85. R. 3. Obv. Door with trace of outer moulding only; no knob. There is a defect in the die above O in of, below the ground, which leads me to believe that the die-cutter, having made a mistake, removed the erroneous letter and replaced it by the proper one. The right ceriph of first A in Canada is defective. The die shows several cracks. Rev. The left thistle leaf presents the same particularities as to that of No. 85 ; the shamrock sprig has four leafless-stems, but lightly cut, especially the left upper one, which is barely visible; even so, it is hard to decide whether any of them are forked ; however, on fine specimens the upper and the lower right ones appear to be so. R. 2. Obv. Resembles No. 87, but the door is perfectly plain - no mouldings or knob, and there is no defect in the die above O in OF. Perfect A's. Perfect fence to the left. Rev. Similar, but city bank on ribbonends and dated 1837. Outer rim of garter broken at the top. There is a V-shaped crack in the die; the base of the crack rests on the lower angle of St. Andrew's cross, while each arm extends respectively to the left and the right angles of same cross. R. 8. This token is much lighter than any of the foregoing ones. Collectors have long been divided in their opinions of this token; different theories have been advanced concerning it. In fact there are almost as many theories as known specimens. It has been generally considered as a result of intercrossing of dies: the obverse of a front-view token with a reverse of a Habitant - a so-called "mule." But after a careful comparison of this penny with the different obverses of the former type and the different reverses of the latter, I have come to the conclusion that it is a variety by itself, with obverse entirely different from others and reverse different also, though slightly, from the Habitant tokens. Consequently, this piece deserves a well-justified place in any collection of Canadian coins, as a regular one. It is quite probable that the obverse die for this token was cut before those of front-view penny of the Bank of Montreal.